In times gone by Florence was one of the highlights of the Grand Tour and was visited by many illustrious literati, art historians and scholars. It was a city that impressed, delighted and sometimes disappointed. 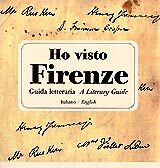 The APT�s latest publication, entitled Ho visto Firenze - A literary guide, offers discerning visitors and local people alike a chance to see the city, as it is today, through the filter of the eyes and impressions of prominent figures from the past. Ho visto Firenze is, then, a very particular kind of guide, which talks about many of the city�s familiar sights like Palazzo Vecchio and Boboli, Fiesole and the Cascine Park, but does so through the words of 36 authors of various nationalities and periods, including the likes of Mark Twain, Theodor Mommsen and Mary Shelley. Published for the APT of Florence by Gallucci Editore, the volume consists of texts (in Italian and English) selected by Maurizio Bossi and fine, delicate illustrations by Giuliano Ferri.